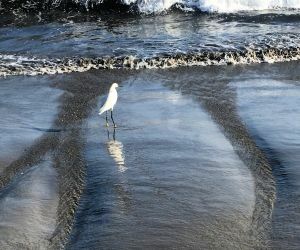 East Beach extends 1.6 miles from Stearn’s Wharf to the Andree Clark Bird Refuge. It is a is a busy destination. 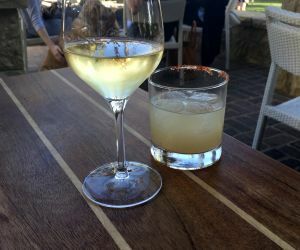 Located across the highway from some of the major hotels in Santa Barbara, visitors wander down to the beach for a sample of Santa Barbara's famous beach atmosphere. 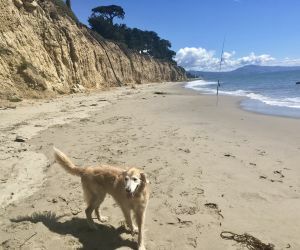 It offers picnic facilities, more than a dozen volleyball courts, a playground, and beautiful ocean views. A steady flow of cyclists and pedestrians are usually seen on the walking/bike trail that runs all the way along East Beach. Located on East Beach is Skater's Point, a 14,600 square foot skateboard park for in-line skaters and roller skaters of all ages. Chase Palm Park is divided by Cabrillo Boulevard. On the inland side are fountains, creeks, a lagoon, and a playground that is fashioned after a 19th century ocean schooner. A large grassy area is used for free summer concerts. Every Sunday, one can stroll along Cabrillo Boulevard from Stearn’s Wharf to Calle Cesar Chavez, to shop and enjoy high-quality crafts made by local artisans at the Santa Barbara Arts and Crafts Show. 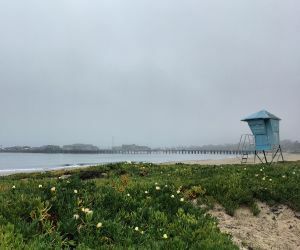 At the southern end of East Beach is the historic Cabrillo Pavilion Bathhouse, which was erected in 1926 to help revitalize Santa Barbara after a devastating earthquake. 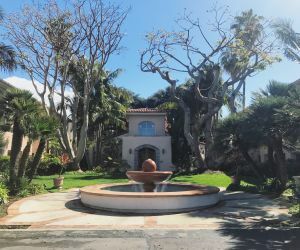 Today the building is shared by the bathhouse, the Cabrillo Pavilion Arts Center, and the East Beach Grill. The city operates the bathhouse portion as a fitness center with a pay-by-the-day option available. It includes showers, a weight room, lockers, and other amenities.